Bothwell Browne (1877-1947) was a Danish-American stage and film performer, best known as a female impersonator, who sometimes appeared with male impersonator Kathleen Clifford. 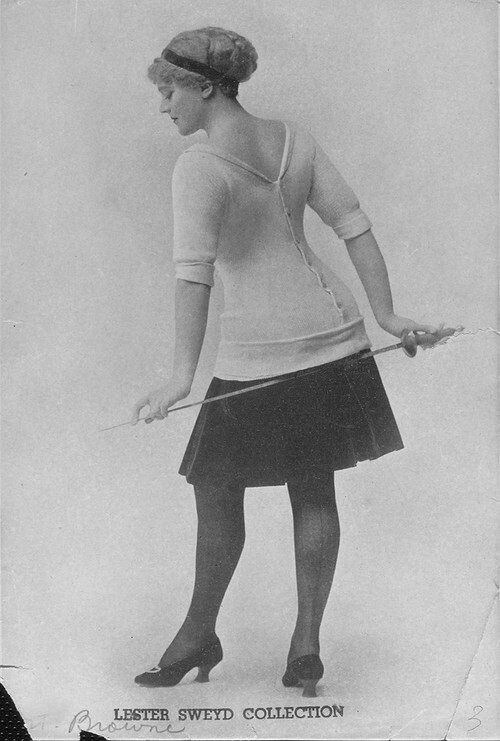 Browne competed with the more famous female impersonator Julian Eltinge. Reputedly, Browne’s act was much more feminine and he passed much better than Eltinge, which led to some problems. Browne’s Broadway production Miss Jack opened in September, 1911 at the Herald Square Theater, and I have a couple of photo stills from that production below. Browne’s only film appearance was in the propaganda film Yankee Doodle in Berlin (1919). He eventually retired to San Francisco, where he taught dance. I included Browne on this site largely due to the photos of him as a female fencer, a subject very dear to my heart.